We are pleased to report that CWA members at Frontier Communications in West Virginia and Ashburn, Va. have voted to ratify the 4-year agreement that the bargaining team reached in March 2018. 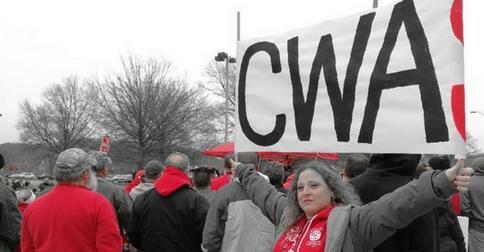 Visit the WV CWA - Fighting for Our Future Facebook page for the latest news. We are pleased to report that CWA members at Frontier Communications in West Virginia and Ashburn, Va. have voted to ratify the 4-year agreement that the bargaining team reached last month. Read the summary of the Frontier WV and Ashburn, VA Tentative Agreement. The Strike is over! The main objective of Job Security for every member in the bargaining unit has been achieved! We have a fair contract for everyone. After three weeks on strike, 1,400 members of the Communications Workers of America will return to work at Frontier Communications in West Virginia and Ashburn, VA by Wednesday. The Frontier Rally was a huge success with hundreds of members, Allies, and elected leaders in attendance. The crowd was energized and steadfast in getting a good contract.